Wanting to help — and knowing how — is this dad’s winning combination. Assistant Scoutmaster, Troop 313, and Clearwater businessman Ed Clark has found that success and happiness go hand-in-hand with being able to help youth learn and grow. A native of Tuscaloosa, Alabama and 1991 Gulf War vet, Ed Clark moved his family to Clearwater in April of 1996, seeking a quieter lifestyle and a closer fellowship with his Church community at the Clearwater Scientology religious retreat. It was an advantageous move for the Clarks, although Ed remains busier than ever — and loving it. The president of a high-tech firm, he and his wife, Linda, are still raising a growing family, while his schedule is rounded out with Church activities and ministerial courses. Yet, he still manages to find the time to immerse himself in youth-oriented community betterment activities, namely scouting. We asked Ed about his volunteerism and how his work with youth enriches his own busy lifestyle. Freedom: You are now an assistant Scoutmaster. How did you first become involved in scouting? And why? Ed: Shortly after arriving in town, one of my new friends, a Scientologist active in the community herself, called me up. She wanted to know if I was interested in working with a Church of Scientology sponsored Boy Scouts unit that was being formed up. She knew I had a young son, and so thought I might be interested in helping out. I said "yes," and invited her over, whereupon she talked to me and Linda on the scouting program and its history in the local area. And as an aside, I found it fascinating to find out from her that the Founder of Scientology, L. Ron Hubbard, had himself an early involvement with the Scouts; he had in fact, in 1924, become the nation’s youngest Eagle Scout at the age of 13 — quite an accomplishment. I was asked to become the Cubmaster for the new Pack 313. I didn’t know much about the practical aspect of scouting at that point, but I was so impressed by the Scouting purpose, and how it aligned to what I wanted for my own child, I decided I really wanted to help forward that purpose. I held that position for nearly five years. Then Kyle, my son, graduated to Boy Scouts and I moved up to along with him. Today, I’m an Assistant Scoutmaster with Troop 313. By the way, my wife has also been involved from the beginning. 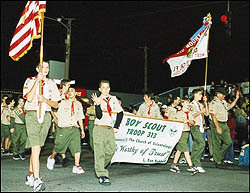 Linda is presently the Treasurer for both the [Boy Scout] Troop and the [Cub Scout] Pack. I couldn’t have done it without her help too, especially in the early years of the pack when we had so much to learn. Freedom: What do you like most about being active in the community with Scouting? Ed: I like to help people. And I know how to help! It’s a winning combination for a volunteer. That may sound trite, but it is very true. Many people I meet say they want to help too, but don’t feel up to it because they do not feel confident about their helping skills. Often they feel they have enough problems just dealing with their own lives. I feel very privileged as a Scientologist — because I have found happiness and success with it and learned so much about myself, that I feel almost duty-bound to now share what I have learned and help others. I have gotten so much, I want to continue to give back to the community. And by the way, it’s a lot of fun too. Freedom: Yes, I can see how it would be. Now, on a slightly different topic, you are also into television — you produce the “What is Scientology?” TV show? How did that transpire? Ed: Well, I am very interested in people understanding what Scientology is, and what it stands for. But I was frustrated with the misconceptions some people have of Scientology. I always had the idea that if people knew the true story of Scientology and its Founder, if they could see what Scientologists themselves said about their experiences, it would tend to dispel those rumors and falsehoods. Then — it was in 1999 — I was at a meeting at the Church and I struck up a conversation with the one of the Public Affairs staff there. I told her I had some professional experience with camera work and editing, but didn’t consider myself a true professional yet and wasn’t doing it full time. Somehow we got onto the topic of public access television and one thing led to another and she asked me to be the producer of the show. So in my spare time, I got the additional training I needed, worked up a crew and our first show was shot in January 2000. And we have been going strong ever since. The show runs about four times a week in the Tampa Bay area on Channel 96 or 21, depending upon what cable provider you use. As of right now, our prime time slot is 8:30p.m. on Thursday nights. In October 2002, our “What is Scientology?” show won the public access “Oscar” for “Best Show — Religion Category.” I really enjoy getting the truth out there, and, as I had hoped, people respond so favorably to it.